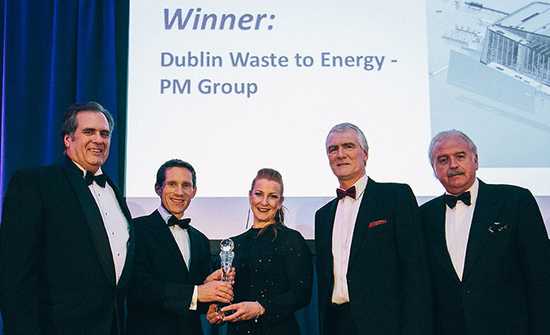 PM Group was delighted to be recognised at the Irish Building and Design Awards and to receive the BIM Initiative of the Year award for the Dublin Waste to Energy (DWtE) Facility. “DWtE is the largest project of its kind in Ireland to date. The delivery of this project required an innovative Building Information Modelling (BIM) Initiative to not only achieve the complex design but to facilitate collaboration by multiple stakeholders in different geographical locations. All of these factors were necessary to deliver such a high profile project,” said Emma Hayes, Group BIM Applications Manager. The BIM Initiative of the Year Award recognises the DWtE project’s multi-disciplinary team comprised of experts from PM Group (Ireland and Poland) and specialist process contractors from Hitachi Zosen Inova (HZI) (Switzerland). The project was based on design criteria set out by the client, Covanta Europe Engineering Ltd. The DWtE Facility is a Public Private Partnership (PPP) between Dublin City Council and Covanta, a provider of sustainable waste and energy solutions, to provide a thermal treatment plant to treat municipal waste that cannot be reused or recycled. Emma Hayes, Group BIM Applications Manager for PM Group, and Dr Barry McAuley, Dublin Institute of Technology Lecturer and BICP Researcher answer your BIM Questions on AR and VR on Irish sites and the prerequisites for postgraduate BIM courses, in our first BIM QnA of 2017. Question: When will AR and VR become common on Irish construction sites? AR and VR could be used on Irish Construction sites tomorrow! The technology is available and with many projects being executed with Building Information Modelling (BIM), virtual reality (VR) and augmented reality (AR) are already possible for construction sites. The hardware such as VR headsets and movement sensors are becoming more mainstream and much more cost effective. In PM Group we are using VR for clients to walk through a virtual simulation of their facility at concept stage which helps speed up the design decision making process. But why would Irish construction sites need to use VR and AR? The emergence of virtual and immersive technology allows the user to overlay a virtual environment or a BIM model with a real environment such as a construction site. For example, a construction worker can view a virtual model of building services hidden above an installed ceiling or behind a constructed wall without disturbing the fabric resulting in less remedial work. But it does not stop there! Imagine being able to send a drone out to a construction site to do a laser scan survey to map progress which can then be viewed using VR to compare with the anticipated progress of the construction. There are also Health and Safety benefits one of which is the development of AR smart construction helmets. These helmets have sensors and visors that relay virtual and real data to the wearer notifying them of any potential health and safety risks. These helmets also provide the user with access to the BIM data as they walk around the site. Virtual and augmented reality are already starting to change the way we interact with our building designs and with the many benefits they bring to the construction process it is only a matter of when and not how they will become common on Irish construction sites. Question: Are there any general prerequisites for doing a postgraduate certificate or master degree in BIM in Ireland? For the Higher Diploma in Engineering in BIM offered in Galway-Mayo Institute of Technology, you must hold a relevant Level 7 qualification or equivalent in a cognate area within the construction and built environment industry. Applications will also be accepted from mature applicants who have worked at an appropriate level within the construction industry and who may gain entry by the RPL process. Send your Questions to @BIMIreland and use #BIMQnA in your Tweets. Emma Hayes is the Group BIM Applications Manager for PM Group. 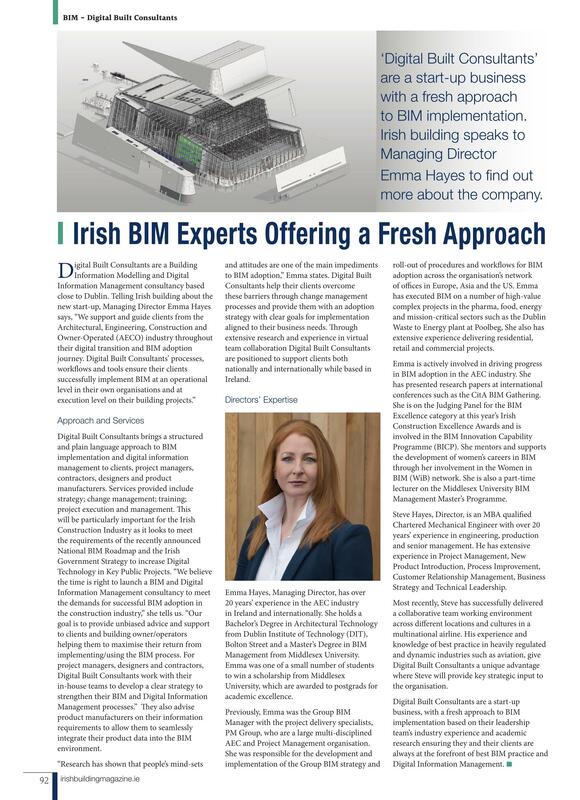 Emma holds a BSc Honours Degree in Architectural Technology from Dublin Institute of Technology and a Master’s of Science Degree in BIM Management from Middlesex University. 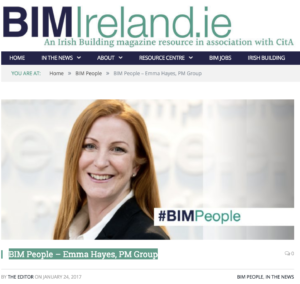 BIMIreland.ie talked to Emma about her work with PM Group and her BIM education and research. Can you tell us about your work as Group BIM Applications Manager at PM Group? I have responsibility for driving the Group BIM strategy as well as the development and roll-out of BIM processes across the organisation’s network of 18 offices in Europe, Asia and the US. This involves communicating our Group BIM goals both internally with our operations teams and externally with our clients. The role is both challenging and exciting as it gives me an opportunity to get involved in a wide variety projects in different sectors and to engage with people across the organisation. The role also involves travel to our offices around the world, my last international trip was to our office in Singapore and I have more recently returned from a visit to our office in Wroclaw in Poland. In your experience what are the main advantages of using BIM? The main advantages of using BIM that we have experienced in PM Group are improved efficiencies in dynamic documentation production and greater collaboration between teams. Our clients benefit from early visualisation of designs, enhanced building performance through analysis/simulation and synchronisation of design with construction resulting in the delivery of comprehensive data at project completion. Please tell us about PM Group’s BIM adoption? PM Group have been executing intelligent 3D process modelling on pharma projects for over 20 years. So therefore, the adoption of BIM has not been seen as a major change to project workflows. Also, PM Group is a multi-disciplined organisation which has been a huge advantage to our BIM adoption since inter-disciplinary collaboration is already the norm. One of the challenges to our BIM adoption is interoperability between software platforms as we have specific engineering tools which do not easily interoperate with BIM tools. We have overcome these challenges with robust model management workflows. BIM is such an important enhancement to our business. My main responsibility is to continue its development aligning it with client needs and industry requirements. What are the main projects on which PM Group has utilised BIM? To date, PM Group has implemented BIM on a number of projects in the pharma, food, energy and mission critical sectors. We are working on several large projects using BIM processes such as the waste energy plant at Poolbeg, Dublin and for clients such as Alexion and GSK. Can you tell us about PM Group’s success in delivering BIM projects? h Autodesk Navisworks Timeliner with MS Project for 4D simulations and Exactal CostX for 5D. We also use tools such as Autodesk Robot, CFD and IES for building performance analysis and simulations. Please tell us about Continuous Professional Development at PM Group? At PM Group, we have an excellent CPD programme and it means that we all view on-going learning as a natural part of our day-to-day lives. I am keen to continue to develop my BIM knowledge, which I do through attending CPD seminars and conferences and continuous research. I am also aware that I can help colleagues and others in the industry sharing my knowledge and experience through involvement in BIM task forces. I have recently volunteered for the BIM Innovation Capability Programme (BICP) Client Working Group. Please tell us about your Master’s Degree in Building Information Modelling Management at Middlesex University and the knowledge and skills you gained? I studied part time for two years through distance learning. The course lectures were delivered via webinar for three taught modules. The modules were a) Technical BIM which improved my understanding of collaboration and coordination of project teams, b) Operational BIM which enhanced my knowledge of quality control, risk assessment and project delivery and c) Strategic BIM which developed my skills for strategic thinking for BIM adoption and implementation at a project level and also at an organisational level. The final module also included a research dissertation. The modules are delivered by a combination of college lecturers and industry expert guest lecturers such as David Philp, Mark Bew and Mervyn Richards from the BIM Task Group. My journey through the Master’s has given me the skills and confidence to critically analyse and think strategically about how to improve BIM processes now and in the future. It has also given me a great opportunity for networking with industry peers. We still keep in touch through social media and although we’re recent graduates, are already planning a class reunion before the end of the year! What recommendations would you give professionals looking to do a BIM course? There are a number of postgraduate BIM courses available in Ireland and the UK so I would recommend reviewing the course content to ensure that the modules meet expectations. If a professional is looking to enhance technical or collaborative BIM skills then it would be important to choose a BIM technology-focused course. Whereas if like me, you are interested in a management focused course then an MSc in BIM Management may be more suitable. It is also worth noting that having previous AEC industry experience and knowledge of BIM technology is a prerequisite for many of the postgraduate BIM Management courses. What advice would you give to a company considering BIM adoption? Research has shown that people’s mind-sets and attitudes are one of the main impediments to BIM adoption. But in my experience, it is also essentially about good communication, especially in virtual teams. BIM technology will become easier to use but unless the team are willing to engage with the processes it will be more difficult to implement BIM. I would advise companies considering BIM to have an adoption strategy with clear goals for implementation. Change management models such as Prosci’s ADKAR model can really help define a clear structure for BIM adoption. After that, the first step is to create an awareness of the need for BIM, support change and encourage a desire for adoption. Coaching, practice and time will help lay the groundwork for adoption. It’s important to keep reinforcing and measuring so that corrective actions can be taken as you build BIM into the culture of your organisation. It’s a team effort. What advice would you give to a client considering BIM for a project? I would advise a client to clearly define their BIM goals for a project. For example, do they want BIM purely for improved coordination between the design team or do they want BIM for the whole lifecycle of the asset? Whole lifecycle BIM requires all project stakeholders from the client, the design team and contractor to the facilities management team to collaborate and share information throughout the process, which would need to be clearly defined at the initial phases. Having an Employers Information Requirement (EIR) document will ensure all stakeholders are informed of the BIM goals and the client’s expectations for the project. Once the decision is made, the rest should fall into place with the right tools and team. Women in BIM is an organisation that aims to draw together women in key strategic positions relating to technology and architecture and allow a portal for shared information and interaction. Women in BIM (WiB) has launched a database of women around the world who work in BIM. Are you a Project Manager/Architect/Engineer/ Quantity Surveyor? Are you a Building Contractor? Are you an Owner or Government Agency? Are you a Building Product Manufacturer? © 2018 Digital Built Consultants.